Create a welcome atmosphere in your yard with the Heartwood Mahogany Starter Home. Clean lines form the silhouette of the home, with a steeply arched roof for contrast. Copper flashing at the peak of the roof adds a bit of color, and lap siding on the front offers texture to the piece. A drainage slot on the base of the house helps keep nests dry, and a gap between the roof and side wall helps the temperature stay regulated. The 1.25" diameter entrance hole offers passage for small songbirds, for a versatile home. A copper cleanout panel on the back can be removed for observation, and the metal hanging hook enables you to wall mount the house. The mahogany construction and hand oiled finish form a durable abode, season after season. 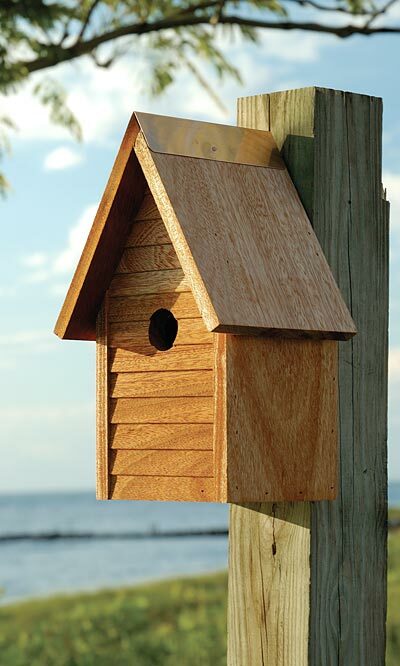 Offer young birds their own roost with this Mahogany Starter Home. Made in the USA.